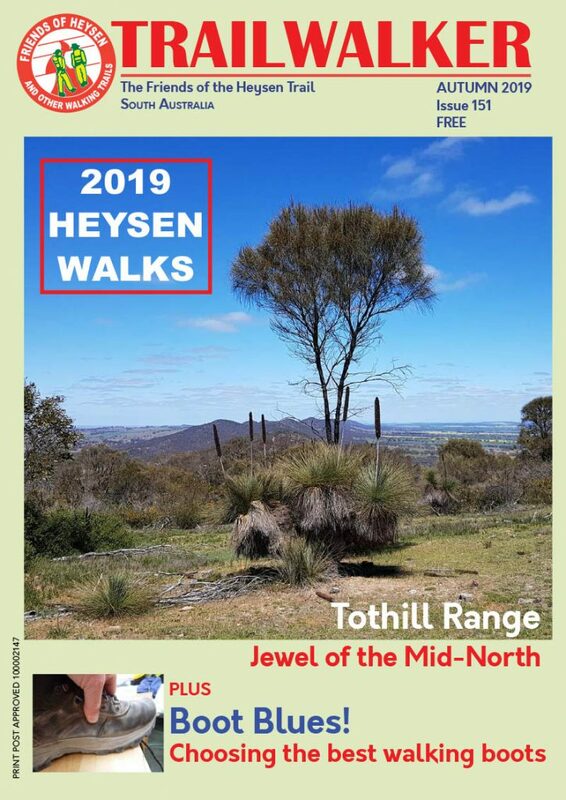 The Friends of the Heysen Trail is a voluntary organisation established in 1986, whose members are involved in both the development and maintenance of walking trails; and the recreational and social aspects of South Australian walking trails. The organisation works in conjunction with other voluntary organisations and Government Departments, and a primary function is to help maintain the Heysen Trail. The organisation is a member of WalkingSA, South Australia’s peak body representing bushwalkers. The Friends of the Heysen Trail comprise families, walking groups, schools and individuals, working together to achieve the common objectives of the organisation. A comprehensive walking programme with various grades of walks is organised, social gatherings are held, and members are kept up to date with activities by means of a quarterly magazine entitled Trailwalker. Working groups carry out routine trail maintenance activities, as well as approved special projects such as installation of water tanks, and structures such as boardwalks. The Friends of the Heysen Trail maintain a shop and office at Suite 212, 2nd Floor Epworth Building, 33 Pirie Street, Adelaide. A branch of the Friends of the Heysen Trail, in the Mid North, maintains a lengthy section of the Trail between Logans Gap (about 40km south of Burra) and Spalding. The branch has undertaken significant projects such as the construction of several water tank/shelters. Another activity of the branch is to foster walking in the area, by conducting a walking program, and branch members are able to provide up to date information on such things as trail condition and access routes. For information about the Trail in the Mid North area email burra.heysentrail@gmail.com.